A certain prominent talk show hosts claims to have found an anti-aging miracle that will take decades off your skin, but should we take his word for it? That’s the claim being made about phytoceramides. These capsules are derived from foods we consume, but what effect does taking ceramides have on our skin? 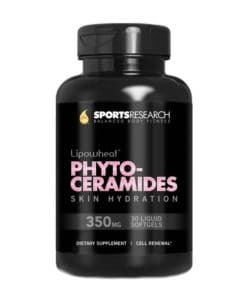 We’ll uncover the science behind phytoceramide supplementation and also explore to what extent they have an effect. Ceramides are a naturally occurring lipid that, amongst other things, keeps your skin hydrated. A lipid is an essential component of the skin in that it effects the functioning of the skin barrier and cell-to-cell communication. An unhealthy skin barrier is easily irritated and more prone to infection. It also leads to water loss that causes dehydrated, flaky and itchy skin. Ceramides have long been used in topical skin care products to assist in skin barrier reparation and the restoration of moisture, leaving the skin more resistant to the visible signs of aging. Phytoceramides are a bit different – they’re taken orally and are derived from plants extracts including rice, sweet potato or wheat. Your skin loses natural lipids like ceramides as you age, and with them goes the support and protection for your skin barrier. This lends itself to the formation of wrinkles, age spots as well as rough and uneven skin. What’s more, the loss of ceramides also makes your skin more susceptible to moisture loss, environmental allergens and more serious skin problems like atopic dermatitis. • Restoring the functions of the skin barrier by acting as a cell-communicating agent. The skin barrier protects against inflammation and infection, sun damage as well as dryness. • Keeps your skin hydrated by helping the skin barrier retain moisture. • Decreases free radicals and inhibits elastase enzymes which contribute to the reduction of elastin, and therefore flexibility in the skin. • Encourages the production of collagen. • Evidence that they inhibit melanogenesis which contributes to hyperpigmentation, age spots, and other skin discoloration. The idea behind supplementing with phytoceramides is that topical applications can’t penetrate the skin as effectively. Because topical ceramides work from the outside-in they don’t follow the body’s natural way of healing itself: the inside-out. By taking phytoceramides orally, they are absorbed into the bloodstream and carried throughout the body. By working from the cells in the inner layer of the dermis to the outermost layer, phytoceramides hydrate and smooth the skin to prevent and treat the visible signs of aging. If you’re looking for a more traditional route to combat dryness and other signs of aging consider exploring our guide on picking a good serum which covers benefits, ingredients to look out for and more. Supplementing with phytoceramides is meant safe, although there isn’t concrete support. SoftGel Technologies’ paper to the FDA stated that there are “no special requirements for use” including limits on the duration of use or dietary restrictions like taking the supplements on. HOW EFFECTIVE ARE PHYTOCERAMIDE SUPPLEMENTS? Truth be told there’s very little independent research to prove the effectiveness of phytoceramides. What little research there is out there shows that they do indeed have an impact on dehydrated skin. But, topical skincare products with ceramides are indeed effective and have a significant amount of scientific pedigree behind those claims. Sports Research 350 mg formula of phytoceramides is both gluten and GMO-free. Containing no artificial ingredients or fillers this product is made of 100% phytoceramides in fulfills the daily does required. 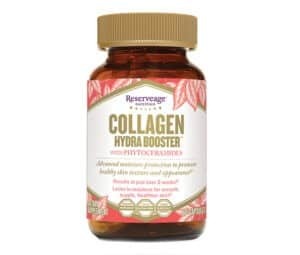 Rserveages supplement combines phytoceramides with collagen in order to replenish your body’s natural lipids and as a by-product boost moisture levels. 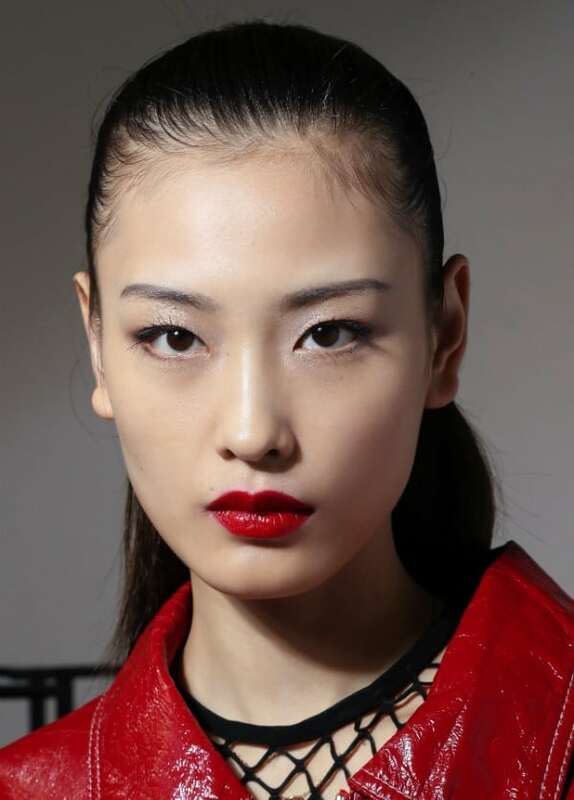 The formula also includes Hyaluronic Acid to increase the potential hydration and plumping effects. 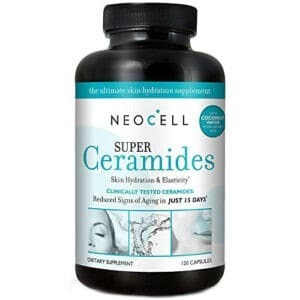 Although it may seem pricer then the other supplements on our list Neocell’s Super Ceramides actually contains 60 days’ worth of phytoceramides. The formula promotes hydration, elasticity and cell regeneration. Other key ingredients include Hyaluronic Acid, Pine Bark, Astaxanthin, Lutein and Coconut Water. First, the health and medical industry agrees that a daily dosage of 350 mg is the optimal amount to take. It takes about a month before any changes will be noticed so be sure to give it some time before any visible effects appear. You’ll want to check that the product you are purchasing states that it is a plant-derived phytoceramide on the package. Having a wheat intolerance or allergy won’t stop you from taking phytoceramides. Just be sure to purchase the variety derived from rice or sweet potatoes and not wheat. Look for an FDA-approved product that is organic, without fillers or artificial ingredients. For even better results, take phytoceramides with a Vitamin C tablet or serum. You can’t believe everything you hear but this wouldn’t be the first time the TV doc has steered us in a good direction. At the very least, there are absolutely no risks in trying phytoceramides for a month or two. Even if they aren’t the miracle product we are hoping for, they have a demonstrated effect on dry skin, and it never hurts to hydrate in any way we can.